VCP5 – done and dusted! A. Remarkably easy, a bunch of monkeys typing randomly would probably pass. B. Unreasonably hard, even a team of VCDX’s working together would be lucky to scrape a pass. C. A fair test of real world http://premier-pharmacy.com/product-category/antiviral/ knowledge. If you’ve worked with vSphere for a while and v5 in particular you’ll be fine. 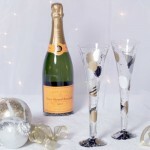 D. all about Veuve Clicqout Ponsardin, a premium brand of champagne. Hint – one answer is related, but not correct! Congratulations on the pass tho! It’s like the real exam – there are some contentious answers! Thanks. do i have to ask my owner to increase my salary ? note : we dont have much project with VMware solution . Should you get a salary increase because you passed an exam? It all depends on the value to your employer and you’ve said that you don’t do much project work with VMware. You can always ask of course – some employers encourage people to better themselves and will offer payrises. What do you have to lose? career and largely of benefit to me. The achievement goes on my CV to help strengthen my experience (and to get me past the recruitment agencies) and taking the exams helps me understand any weak spots in my skillset. Unless your company is a partner and needs the certifications as part of some qualifying criteria it may not offer any benefit to them.